This is Griff, our new puppy! He hasn't come to live with us yet (another 4 weeks). He's a long-haired chihuahua. 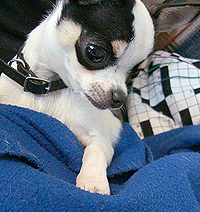 He will be the little brother for Petal, who is a short-haired chihuahua. As you can see, she likes crosswords.